Abbott’s FreeStyle Libre – Transforming Glucose Monitoring Through Utter Simplicity, Fingersticks Aside! In October, Abbott launched its highly awaited FreeStyle Libre Flash Glucose Monitoring system in Europe. The unique product is intended as a replacement for blood glucose meters, while giving patients many of the benefits of continuous glucose monitoring (CGM), including real-time glucose values, trend information and comprehensive reports. Though it is not yet approved in the US, we were able to test the product over the past month (the device can only be ordered online from websites in Europe). Given what we had heard from so many European bloggers, we had high expectations going into our test, and FreeStyle Libre absolutely met them at every step – the system was easy to setup and use (a major win for healthcare providers); discreet to wear on the upper arm; accurate enough from which to dose insulin, with performance similar to Dexcom’s G4 Platinum CGM (though no fingersticks were required); and it gave an excellent picture of glucose trends through real-time and on-device reports. In short, it is transformative compared to the limited information provided by traditional blood glucose meters, all in a package anyone can pick up and learn to use. We give FreeStyle Libre an emphatic thumbs up and would recommend it to nearly anyone with diabetes, especially those on insulin who test their blood glucose frequently and want more actionable information than fingersticks alone can provide. One key point of difference from CGM is that FreeStyle Libre does not have high or low alarms, meaning it is not as ideal for those with lots of hypoglycemia or hypoglycemia unawareness. This article discusses our experience wearing and using the device, its accuracy compared to the Dexcom G4 Platinum CGM, how European readers can get it, when we might see it in the US, and how it’s different from CGM. When is FreeStyle Libre Coming to the US? FreeStyle Libre includes a very tiny glucose sensor (0.2 inches in length, about the thickness of a hair) worn under the skin and connected to a water resistant, plastic on-body patch the size of a one-dollar coin. The sensor remains inserted for 14 days and does not require fingerstick calibrations (it’s “factory calibrated”). After putting it on the upper arm and waiting one hour, it immediately begins reading glucose and trend information. FreeStyle Libre is approved for dosing insulin except in three cases when a fingerstick is recommended: when hypoglycemic, when glucose is changing rapidly, or when symptoms don’t match the system’s readings. To use FreeStyle Libre, users take a touchscreen reader device, hold it near (within 1.5 inches) the sensor patch, and wait for it to beep. In less than a second, they can see their real-time glucose value (e.g., 102 mg/dl), a glucose trend arrow (e.g., rising), and a trend graph showing the last eight hours of data. The reader device displays reports on its screen that can be downloaded to Mac and PC-compatible software. The system is currently available in Europe (pricing information below) for people with both type 1 and type 2 diabetes. Abbott does plan to bring it to the US, though we estimate it won’t come stateside until at least mid-2016. Each 14-day sensor patch comes with a simple applicator to apply it to the upper arm. The insertion process took us less than 15 seconds, could be done with one hand, and passed the no-instruction-manual test with flying colors – (i) press sensor onto applicator; and (ii) press applicator onto upper arm. Pain wise, Kelly found the upper arm insertion completely painless, and she tends to be very pain sensitive. Adam experienced a bit of pain, as the spot he chose did not have very much subcutaneous fat. However, for both Adam and Kelly, insertion was much easier, more intuitive, and less painful than inserting the Dexcom G4 Platinum and Medtronic Enlite sensors. The FreeStyle Libre sensor is very tiny – only 0.2 inches – making it over three times shorter (roughly) than the Dexcom and Medtronic devices. Once inserted, starting the 14-day sensor only requires three steps: (i) tap “start sensor” on the touchscreen reader; (ii) hold the reader within 1.5 inches of the sensor (to “scan” it); (iii) wait one hour. Once the 60-minute countdown ends, the system gives real-time glucose values and trend information. No glucose meter values required! While the upper arm seems like a very noticeable and perhaps annoying location, the sensor patch is so small and light that we forgot we were wearing it. The low profile patch also comes with very, very sticky adhesive. Kelly’s sensor stayed on for all 14 days, and once the sensor session ended, it required a bit of force to remove. Adam’s sensor fell off on day 13, and he tends to be very active; by contrast, his Dexcom sensor only lasted until day 11, and that required additional taping. Abbott is pursuing approval for alternate wear locations (e.g., stomach, thigh) that could be more discreet. Unlike traditional CGM, FreeStyle Libre does not continuously send real-time glucose data to the reader; rather, the sensor patch must be “scanned” with the reader to obtain the real-time glucose value, trend arrow, and trend graph. 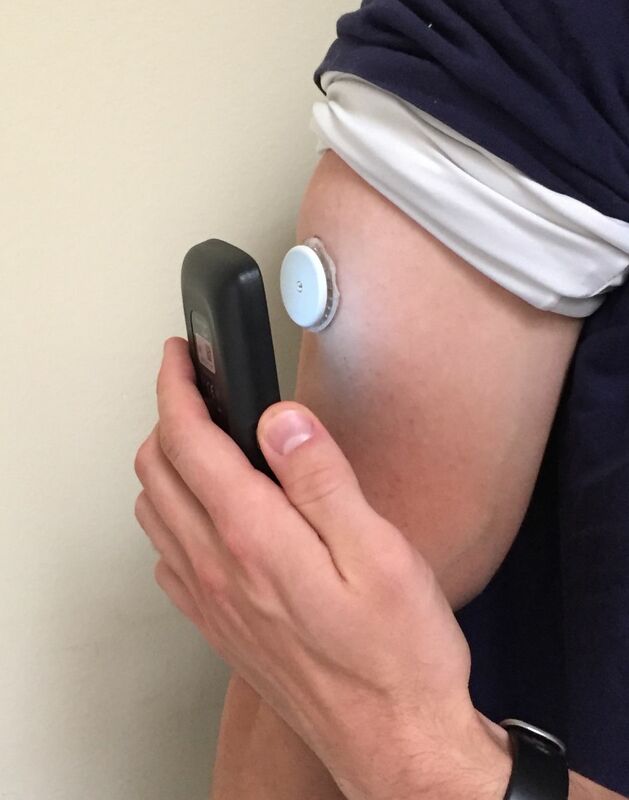 The sensor patch stores up to eight hours of glucose data at a time (values are taken every minute). Adam averaged 11 scans per day during his wear and captured nearly 100% of the glucose data. Like viewing data on a CGM receiver, there is no limit to the number of scans that can be taken. Abbott did an outstanding job of designing the scanning process to take less than three seconds. Hitting the single button on the touchscreen reader immediately turns it on and brings up the “Scan Sensor” menu. From there, holding the reader within 1.5 inches of the sensor obtains the real-time value/trend and past eight hours of glucose information (displayed on a line graph, just like traditional CGM). The scanning process works through many layers of clothing, allowing for excellent discretion and flexibility. From the home screen, you can also add tags to each scan, such as carbs, insulin, exercise, and customizable options. There is a certain fun quality, cool factor, and psychological pleasure to scanning the sensor patch. Each scan is accompanied by an encouraging “ding” sound, followed by seeing the data on the reader. It feels almost like magic to be cheating the hassle of traditional blood glucose meters, especially because there is no limit or cost associated with additional scans. And importantly, FreeStyle Libre displays the number and trend arrow in black, no matter how high or low it is – it’s a very non-judgmental product, which takes some of the stress away from obtaining such detailed glucose data. Hypoglycemia is appropriately shown on the trend graph in bright red, however, to call attention to it. Overall, FreeStyle Libre’s accuracy was downright impressive and seemed reliable enough for dosing insulin. To test real-world accuracy, Adam wore the FreeStyle Libre at the same time as a Dexcom G4 Platinum sensor (calibrated twice per day). He compared the real-time information generated by both devices to 46 blood glucose meter values taken over two weeks. On average, FreeStyle Libre was only 12% different from the meter value, very similar to 13% for the Dexcom G4 Platinum (note: Adam was not using Dexcom’s new 505 software, released in November, which does improve the G4’s accuracy). In addition, both devices had a similar number of sensor values that were more than 20% off from the meter value (seven with FreeStyle Libre vs. eight with Dexcom). FreeStyle Libre’s accuracy was also strong in hypoglycemia. Adam experienced nine blood glucose readings <80 mg/dl over the two-week period, and on average, FreeStyle Libre was about 11% off vs. 8% for the Dexcom G4 Platinum. Lag time between the meter value and the sensor value was similar with FreeStyle Libre and the Dexcom G4 Platinum – about five to ten minutes at most. 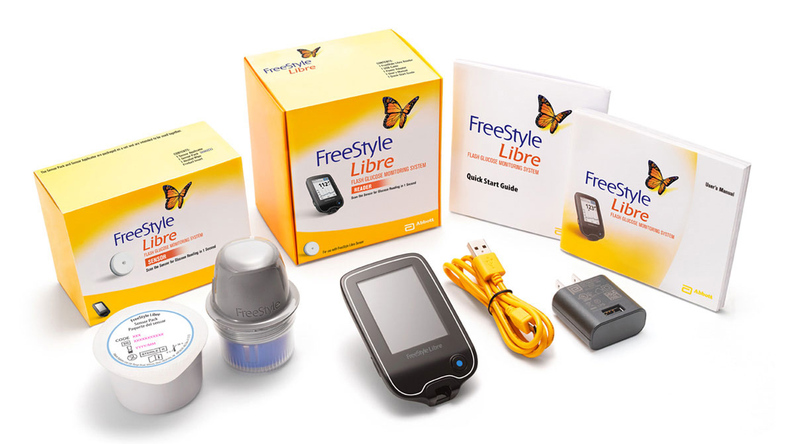 The sensor technology in FreeStyle Libre is based off the highly accurate FreeStyle Navigator CGM, which originally launched in the US in 2008 and was discontinued in 2011. With that in mind, we weren’t too surprised to see the new device’s strong accuracy. However, the fact that FreeStyle Libre maintains the accuracy of the Navigator - but without fingersticks – represents a major accomplishment. On-device reports provide outstanding overview of recent glucose history and problem areas. The FreeStyle Libre reader takes Abbott’s FreeStyle Insulinx meter and adds a sharp color screen. The reader is small, light, and easy to navigate with a touchscreen, icon-based interface (check glucose, history, and settings). It has a micro-USB port for recharging (we only needed two charges over two weeks of wear, though this depends on usage), and it can be downloaded to Mac or PC software. The reader also includes a built-in FreeStyle blood glucose meter for the few cases where Abbott recommends a confirmatory fingerstick (hypoglycemia, fast rates of change, when symptoms don’t match the reader). Average Glucose (displayed by time of day) – A great way to see if one six-hour chunk of the day is particularly problematic. Daily pattern – A shaded 24-hour trend graph that makes clear the times of day with the most outlier high/low values. Daily graphs – An awesome way to scroll day-by-day and see the 24-hour trend graph obtained on that day. In presentations leading up to the launch, Abbott also promoted the Mac- and PC-compatible software that comes with FreeStyle Libre. The software seeks to simplify glucose data analysis, both through a traffic light system (to identify problem areas) and a single one-page report called the Ambulatory Glucose Profile. The goal is to equip healthcare providers and patients with simple tools to better tailor and individualize their therapy. Unfortunately, we were not able to download the software for this test drive, but look forward to trying it in the future. FreeStyle Libre is available at online web-shops in seven European countries: UK, France, Germany, Italy, the Netherlands, Spain, and Sweden. The touchscreen reader (one time cost) and each 14-day sensor cost €59.90 (~$77 US) – significantly cheaper than paying cash for traditional CGM although definitely more expensive than several strips a day (what is covered for many type 2 patients). Notably FreeStyle Libre does not require a prescription in the EU. Payment for the system is out-of-pocket right now, though Abbott is currently enrolling participants for two clinical trials that should help support reimbursement throughout Europe. Do you want one? If so, you need a friend with a credit card based in one of the countries that it’s available, plus their ability to access the Freestyle Libre website in that country – plus, the ability to pay for this fascinating technology. Abbott is currently conducting an accuracy study of FreeStyle Libre in the US – more information is here. The study is expected to be completed in March. Abbott would then need to secure FDA approval of FreeStyle Libre, which would likely take at least 12 months. We imagine that at the very soonest, FreeStyle Libre could come to the US in mid-2016. Appendix: How Is FreeStyle Libre Different From Continuous Glucose Monitoring (CGM)? FreeStyle Libre does not have alarms or alerts, since the glucose sensor data is not sent continuously to the reader device. Rather, a scan of the sensor patch using the reader obtains the glucose data and trend information. By contrast, traditional CGMs continuously send the glucose data to the receiver/pump, allowing low, high, and rate-of-change alerts. This makes CGM a more attractive choice for those with lots of hypoglycemia and hypoglycemia unawareness. However, those who are bothered by lots of alarms might prefer the design of FreeStyle Libre. FreeStyle Libre is “factory calibrated,” meaning users don’t have to enter any blood glucose meter values into the system. After the sensor is started and worn for one hour, it can show glucose data points and trends. Conversely, Medtronic and Dexcom CGMs require startup calibration, as well as daily calibrations to maintain the sensor’s accuracy. Factory calibration represents a highly impressive R&D achievement. FreeStyle Libre is approved for dosing insulin except in three cases: when hypoglycemic, when glucose is changing rapidly, or when symptoms don’t match the system’s readings. In these cases, Abbott recommends confirming the value with a fingerstick. By contrast, Medtronic and Dexcom users are currently supposed to confirm every CGM value with a fingerstick before dosing insulin. At just €59.90 (~$77 US) for the touchscreen reader and each 14-day sensor, FreeStyle Libre has a much lower cost relative to current CGM. For example, Dexcom charges ~$885 for the starter kit and ~$72 per seven-day sensor. Most US patients have reimbursement for CGM, so they pay less than that price; however, most European patients don’t have reimbursement for CGM, making FreeStyle Libre’s affordable price that much more notable. Abbott is currently conducting two studies to support reimbursement. FreeStyle Libre does not require a prescription and can be ordered online. Dexcom and Medtronic CGM both require a prescription and have a longer on-boarding process (training, insurance verification, phone calls, etc. ).